Introducing the Fall 2015 women’s Colvin Klein Collection, where unexpected, contrasting proportions collide one come to life. Silhouettes are simply streamlined. Sophisticated yet sporty; delicately blended and tree-spirited. Skirts in full length or mints allude to the daringly, unpredictable purity one provocation of the collection. Urban sportswear transforms as a second skin with metallic knit jumpsuits and turtlenecks paired with patchwork and patent leather. Coats are key for the season with reinterpreted trenches and mini peacoats. 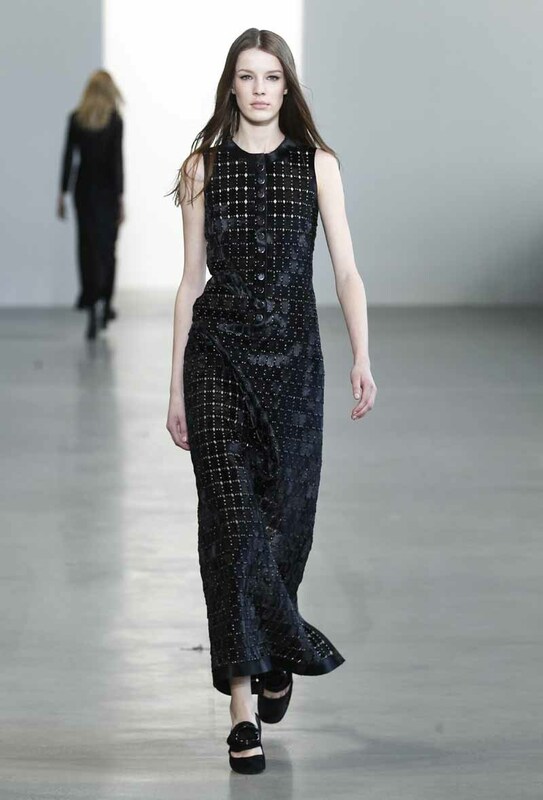 Evening emerges with a maxi dress with a plunging neckline, constructed from a web of precisely linked skins. Manipulated, textural leathers and softly luxe wools ground the collection. Cashmere and woven chenille are contrasted by parchment leather and shearling, which is sometimes curled, sheared, embossed, raised, or needle punched for effect. Patchwork provides an intricate artisan appeal, white deconstructed, frayed edges and stud details add a youthful, yet elevated exuberance. The palette consists of a gradient of feminine and naturally subtle hues – ringing from ivory to blush one wood-form the base. Complimenting shades of block, forest, terracotta, aubergine, and burgundy add powerful depth to the line. Hints of metallic accents bring shimmer and oflure, while potent surfaces give u luxurious, glossy undertone.